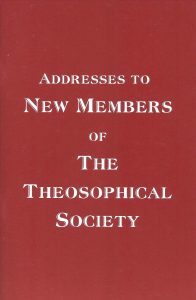 46 pages | 2nd Edition 2010 | Paperback | The Theosophical Publishing House, Adyar. With Adresses of: Henry Steel Olcott (1832 - 1907), Annie Besant (1847 - 1933), Charles W. Leadbeater (1854 - 1934), George S. Arundale (1878 - 1945), C. Jinarājadāsa (1875 - 1953), N. Sri Ram (1889 - 1973) and Radha Burnier (1923 - 2013).
" My Brother, I address you as a brother and not as a friend, because our whole basis of the work of our Society is based upon the attempt to realize and practise the significance of the great Law of Brotherhood. 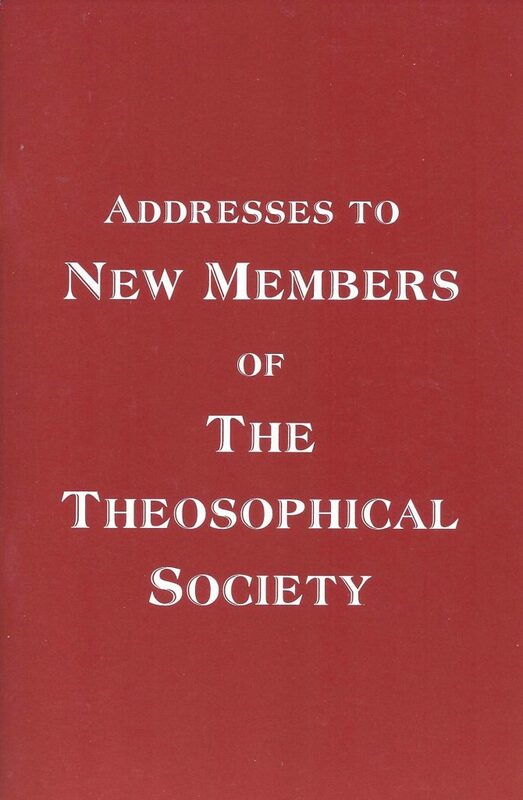 When you signed up your application to join, you read what are the Three Objects of the Society; but of these the first and foremost is that of Universal Brotherhood [...] " (p. 27).